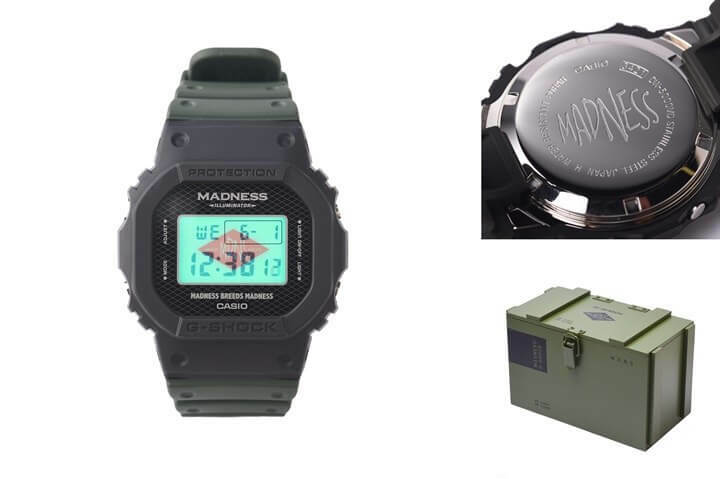 Update: The Madness x G-Shock DW-5000MD-1 is actually based on the current DW-5000 replica of the original 1983 G-Shock DW-5000C featuring a screw-lock case back. This is a model we usually see as the base for G-Shock anniversary limited editions and it is rarely used for collaborations. 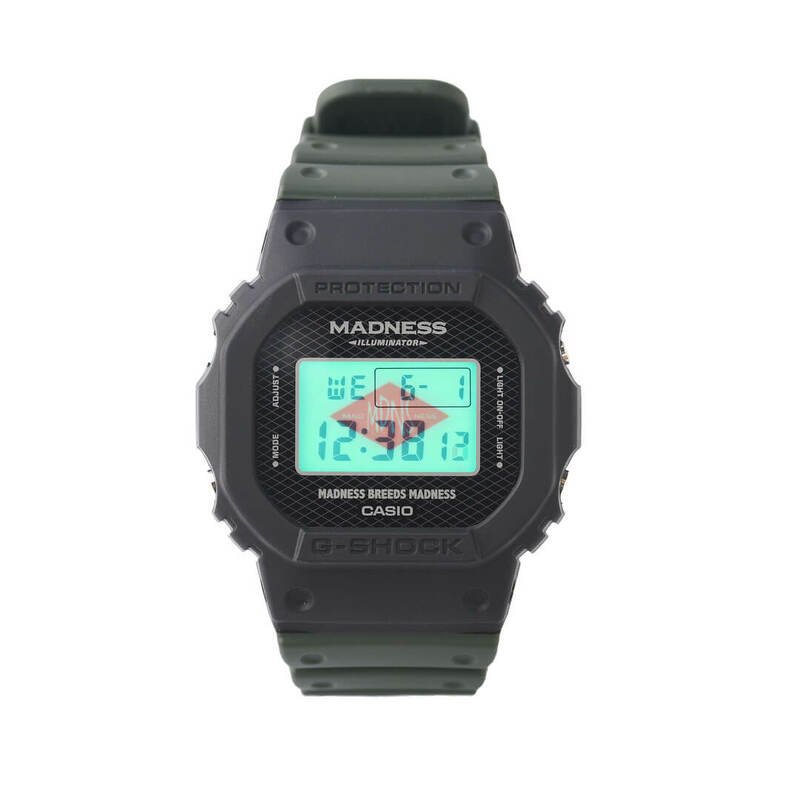 The DW-5000MD’s screw-lock case back is engraved with a Madness logo, and the band is dark green. A custom black and olive green box and tin case round out the package. A custom military-inspired box that resembles a wooden ammunition box was also spotted in promotional photos, and this might be a special edition case. The DW-5000MD-1 will be available by registering at the Madness Online Store on 25 June 2018, and at HBX on July 4. It appears that both sites will be running a lottery for potential buyers. The watch will also be available at the G-Shock Casio Store in Hong Kong on 14 July. (We’re guessing that is the store at Ocean Terminal). Please follow facebook.com/CASIOGSHOCKHongkong (may redirect if you’re outside of Hong Kong) or gshock_hongkong on Instagram for updates. More information is available on this Facebook post in Chinese. Update: The DW-5000MD-1 will also be available on 15 July 2018 in limited quantities at Casio concept stores in Taipei, Taiwan. For more information visit casio.com.tw. 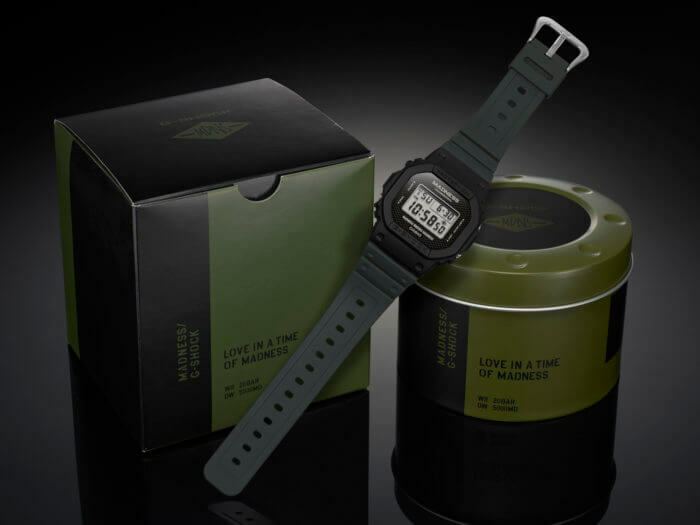 Hong Kong actor and entrepreneur Shawn Yue revealed an upcoming Casio G-Shock DW-5600 collaboration with his clothing label Madness (also known as MDNS). 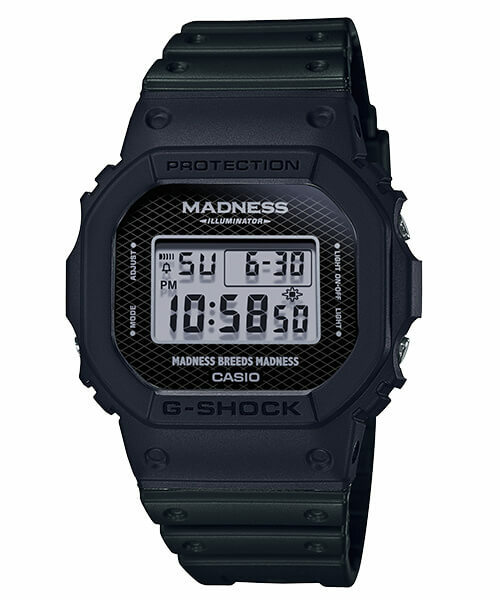 The watch is a matte black DW-5600 [DW-5000 screw-back] with stealth bezel lettering, Madness branding, a mesh-like pattern on the face, and a Madness logo on the EL backlight. No release date is available at the moment. Keep an eye on mdnsonline.com for more information. Is also available in the U.S. at the G-Shock SoHo store in New York City.